← ROSES, Planting, Pruning and General Care. Reason Three …The peony plant is young, with a small root. It might take a year or two, to grow bigger and get established before blooming. Reason Two …The peony was planted in an area of not full sun. Full sun is 6 plus hours of direct sunshine a day. Reason Number One …The number one reason a peony does not bloom, is it’s planted too deep. Peonies like to be planted shallowly. They only want about 1 inch to 1 1/2 inches of soil covering their eyes, when you are planting them. (see illustration). A quick remedy, for the time being, until mid to late August, when you will dig it up and replant it, is to carefully scrape some soil, and any excess mulch away from the plant. Scraping the soil away will not encourage it to bloom this year, but you will be giving it growth conditions that it prefers. 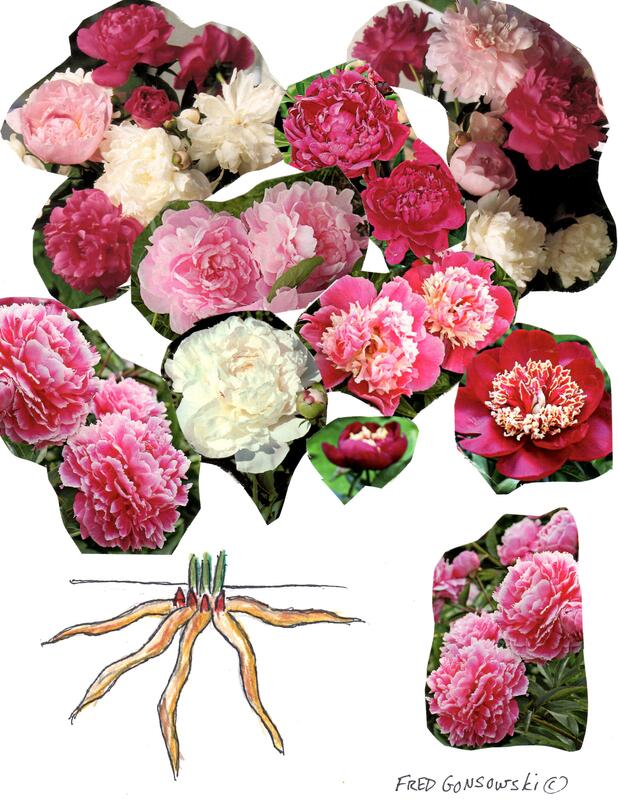 Blooming or not, feed the peony in Spring with an all-purpose granular fertilizer like Pennington 6-10-6, Jonathan Green 5-10-5, or Espoma Plant-Tone 5-3-3. Replanting/Moving a Peony There in the Upper Hudson Valley of New York State, which is zone 5-4, anytime after August 15 is right for digging up the peony and replanting it. The root system of a Peony kind of resembles a bunch of carrots or parsnips. The roots grow out horizontally and point downward to the numbers 4 or 8 on a clock. In mid August, they will already have formed nice growth tips (buds/eyes) for the following season, which look reddish. Lifting the Peony …Without cutting off, or damaging the foliage slowly start digging about a foot and a half, out all around the peony plant. It is better to start digging further out, than going too close, too quickly, and slicing off part of the root. Amending the Soil …Dig and lift the peony plant and put it to the side for a moment. In the spot where the peony was previously planted amend (improve) the soil with a couple of shovels each of dehydrated cow manure and sphagnum peat moss. I mix soil and amendments together in a wheel barrel. You can also mix the combinations on a piece of card board, or tarp put on the ground. Planting the Peony …Dig a new hole for the peony, fill it with water, and wait for it to drain away. Reposition the peony and plant it shallowly! With your hands press down the soil around the plant to eliminate any air pockets. Take a watering can, or hose and slowly water the spot thoroughly. If you see the soil has settled, wait a few minutes, pull the plant up out of the ground a bit, and add more dirt. Make sure those eyes (buds/tips) are not covered by more than 1 to 1 1/2 inches of soil. After replanting, don’t bother to fertilize until the following Spring. The dehydrated manure and sphagnum peat moss is all that is needed. After replanting, water it twice a week to help the plant reestablish itself. Don’t just sprinkle water on the ground, made a puddle. You have to get moisture all the way down to the bottom of the hole you dug. At the end of September, or beginning of October, when the leaves turn a bronze color, and start looking kind of mildew ridden, cut the plant back to the ground. Peonies are long-lived plants. I have plants that are ancient. They have been in the ground, here at Whimsey Hill, and never moved or divided for 21 years. All of my peonies came from my Grandmother’s garden, they could be 50 to 75 years old. Every Spring when they bloom I think of her. She had all kinds, so I never had to buy any myself. Hopefully after following these easy steps, next Spring, your peonies will bloom for you. After the peony blooms, cut back the stem that produced the flower head to just above where some leaves form. You want to make that stem uniform with the height of the rest of the plant. 9 Responses to My Peonies don’t / won’t bloom. Hi Fred, always enjoy your website Especially the sections on tomatoes and the peonies. Do you know what varieties of peonies you have? I also wonder if you have had any experience with this: I don’t usually mulch my perennials very often. I love to get new seedlings from my plants, such as my hellebores. I bought a bunch of cedar mulch this year and now I’m wondering if I may not get any more seedlings. What do you think ? All my peonies were my Grandmothers, and they are old varieties. If I looked through a garden seed catalog , I could find ones that look similar to what I have, but it would still be guessing. As for the mulching, I would say just mulch parts of your garden. Mulch the front edge, or around big plants in the back. That way you will have exposed soil, where seed can take hold and grow. Here at Whimsey Hill House, i have mulch in day lily beds, and as the path for the vegetable garden. I put Preen on all the beds to STOP self seeding. I am at a point where I like plants that don’t self seed too much, get fat, and stay in place. My self seeders are put in spots where they don’t give me extra work to do. Before the Preen, I was pulling like, 38 big brown bags of volunteers from the beds and boarders in the Spring. Now the first weeding is about 8 big brown garden bags. Thanks very much, Fred. Too deep was my suspicion. I raisedand replantede it earlier this spring. It may also be young. My husband gave it to me as a gift…and he planted it. (Two seasons ago.) I’ll cut the foliage down this fall. We live in Northern Utah near Park City elevation 5800′. Similar climate to where I lived in VT. I have wonderful memories are huge peony blossoms. Good article. I have no problem with mine flowering but I need to move a peony and have been afraid because I heard they don’t like to be moved. I’m going to try and dig a very large area hoping not to make it mad. Mine blooms every year but a blue spruce has gotten so large that it’s being taken over so I must move it. It’s not even getting full sun anymore but it still blooms. I suspect because it’s been there for at least 10 years that it is happy in its spot. Hi there Liz, I live in up-state New York, and if I were going to move the peony I would do it from August 15 into the middle-end of September. In my area, after August 15, plants are already done with their growth cycle, and are starting to slow down for a Winters rest. Also, if the peony is moved from August to sometime toward the end of September, it would still have a month or so, of time to grow some new roots and get ready to be dormant. Just make sure you plant it shallowly (you will see the new eye shoots for next year when you dig it up). Also, don’t panic if next year it does not bloom, as it might still need a season or two to acclimate itself to its new home. Good luck with your gardening project. Our Sarah Bernhardt peony is in full sun and has bloomed beautifully for more than 20 years. However, a couple of years ago, I noticed fewer blooms until last year there were fewer yet and did not last more than 5 to 7 days. This year there were exactly 2 blooms which did not last a week. What can be the matter? Did I not water enough or feed it enough? Or do both too much? Please advise as to what action I should take. Hi there Marjorie, sometimes plant foods encourage foliage growth versus flower production, it all depends on how that plant food is mixed. I would say, don’t fertilize for a year or two and see if the plant starts blooming again. When purchasing plant food, next time, buy plant food for “roses” and give them a feeding when they are about a foot tall in the Spring. Good luck with your peonies and have a happy gardening season. I purchased my first red peony last fall and it lived all winter in the container outside against my house, in south central PA. This spring it came up beautifully and got 2 buds, but never bloomed. It should be getting full morning sun. What do you suggest? Hi there Margie, your peony is a young plant, so plant it and see what happens next year. I have all of my grandmother’s peonies and even thought they produce buds, not all of them ever open and bloom. Most sun-loving plants want 6 plus hours of sunshine daily, so east facing plants should do OK.